Abdelaziz Bouteflika ( pronunciation (help·info); Arabic: عبد العزيز بوتفليقة‎, translit. ʿAbd al-ʿAzīz Būtaflīqa [ʕabd lʕziːz buːtfliːqa]; born 2 March 1937 in Oujda, Morocco) is an Algerian politician who served as President of Algeria from 1999 until 2019. As President, he presided over the end of the bloody Algerian Civil War in 2002 when he took over the project of Liamine Zéroual (Previous president), and he ended emergency rule in February 2011 amidst regional unrest. Prior to becoming president, he served as Minister of Foreign Affairs from 1963 until 1979 and as President of the United Nations General Assembly for a 1-year term from 1974. Bouteflika resigned on 2 April 2019 after months of mass protests. With nearly 20 years in power, he was the longest-serving head of state of Algeria. Abdelaziz Bouteflika was born on 2 March 1937 in Oujda, French Protectorate in Morocco. He is the son of Mansouria Ghezlaoui and Ahmed Bouteflika from Tlemcen, Algeria. He has three half-sisters (Fatima, Yamina, and Aïcha), as well as four brothers (Abdelghani, Mustapha, Abderahim and Saïd) and one sister (Latifa). Saïd Bouteflika [fr; es; ar], 20 years his junior, would later be appointed special counselor to his brother in 1999. Unlike Saïd, who was raised mostly in Tlemcen, Abdelaziz grew up in Oujda, where his father had emigrated as a youngster. The son of a zaouia sheikh, he was well-versed in the Qur'an. He successively attended three schools in Oudja: Sidi Ziane, El Hoceinia, and Abdel Moumen High Schools, where he reportedly excelled academically. He was also affiliated with Qadiriyya Zaouia in Oujda. In 1956, Bouteflika went to the village of Ouled Amer near Tlemcen and subsequently joined—at the age of 19—the National Liberation Army, which was a military branch of the National Liberation Front. He received his militarily education at the École des Cadres in Dar El Kebdani, Morocco. In 1957–1958, he was designated a controller of Wilaya V, making reports on the conditions at the Moroccan border and in west Algeria, but later became the administrative secretary of Houari Boumédiène. He became one of his closest collaborators and a core member of his Oujda Group. :12 In 1960, he was assigned with leading the Malian Front in the Algerian south and became known with his nom de guerre of Abdelkader al-Mali, which has survived until today. In 1962, at the arrival of independence, he aligned with Boumédienne and the border armies in support of Ahmed Ben Bella against the Provisional Government of the Algerian Republic. On 8 April 2004, he was re-elected by an unexpectedly high 85% of the vote in an election that was accepted by Western observers as a free and fair election. This was contested by his rival and former Chief of Staff Ali Benflis. Several newspapers alleged that the election had not been fair. Frustration was expressed over extensive state control over the broadcast media. The electoral victory was widely seen as a confirmation of Bouteflika's strengthening control over the state, cemented through forcing General Mohammed Lamari to resign as his chief of staff and replacing him "with Ahmed Salah Gaid, his close friend and ally." Only 17% of people in Kabylie voted in 2004, which represented a significant increase over the violence-ridden legislative elections of 2002. Country-wide, the registered turnout rate was 59%. During the first year of his second term, Bouteflika held a referendum on his "Charter for Peace and National Reconciliation", inspired by the 1995 "Sant'Egidio Platform" document. The law born of the referendum showed that one of Bouteflika's goals in promoting this blanket amnesty plan was to help Algeria recover its image internationally and to guarantee immunity to institutional actors. 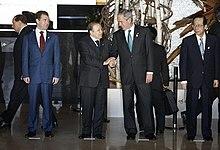 Abdelaziz Bouteflika meets the President of Brazil, Lula da Silva, on a state visit to Brasília, in 2005. During Bouteflika's second term he was sharply critical of the law—passed after the 2005 French riots—ordering French history school books to teach that French colonisation had positive effects abroad, especially in North Africa. The diplomatic crisis which ensued delayed the signing of a friendship treaty between the two countries. In 2004 Bouteflika organised the Arab League Summit and became President of the Arab League for one year. His calls for reform of the League did not gain sufficient support to pass in during the Algiers summit however. In 2013, Bouteflika suffered a debilitating stroke. A journalist, Hichem Aboud, was pursued for "threatening national security, terrtorial integrity, and normal management of the Republic's institutions" and his newspapers were censored, because he wrote that the President had returned from Val-de-Grâce in a "comatose state" and had characterized Saïd Bouteflika as the puppet-master running the administration. Bouteflika cabled his congratulations to freshly-reelected Bashar al-Assad on 19 April 2014. On 20 February 2017, the German Chancellor Angela Merkel canceled her trip to Algeria an hour before takeoff, reportedly because Bouteflika was suffering from severe bronchitis. In June 2017, Bouteflika made a rare, and brief, appearance on Algerian state television presiding over a cabinet meeting with his new government. In a written statement, he ordered the government to reduce imports, curb spending, and be wary of foreign debt. He called for banking sector reform and more investment in renewable energy and "unconventional fossil hydrocarbons." Bouteflika is wheel-chair bound and has not given a speech in public since 2014 due to aphasia following his stroke. On 10 February 2019, a press release signed by long-ailing Bouteflika announcing he would seek a fifth consecutive term provoked widespread discontent. Youth protesters demanded his picture be removed from city halls in Kenchela and Annaba in the days before the national demonstrations on 22 February, organized via social media. Those in Algiers, where street protests are illegal, were the biggest in nearly 18 years. Protestors ripped down a giant poster of Bouteflika from the landmark Algiers central post office. On 11 March 2019, after sustained protests, Bouteflika announced that he would not seek a new term. However, his withdrawal from the elections was not enough to end the protests. On Sunday, 31 March 2019, Bouteflika along with the Prime Minister Noureddine Bedoui who had taken office 20 days earlier, formed a 27 member cabinet with only 6 of the appointees being retained from the outgoing president administration. The next day, Bouteflika announced that he would resign by 28 April 2019. Acceding to demands by the army chief of staff, he ultimately resigned a day later, on 2 April 2019. ^ "Algérie : Bouteflika et les femmes – JeuneAfrique.com". 3 March 2015. Retrieved 11 April 2018. ^ "Introduction ::Algeria". Archived from the original on 13 October 2012. ^ a b c d e f Dalila Belkheir; Khadidja B. "Bouteflika : Maquisard, Ministre et Président de la république". Ennahar Online. Archived from the original on 6 October 2011. Retrieved 27 August 2011. ^ Farid Alilat (5 August 2013). "Saïd Bouteflika: Mister mystère". Jeune Afrique (in French). Retrieved 7 April 2019. ^ a b "Abdelaziz Bouteflika". Fanack.com. Retrieved 9 August 2016. ^ a b c d e "Abdelaziz Bouteflika, president of Algeria Biography". Encyclopaedia Britannica. Retrieved 2 April 2019. ^ "UN General Assembly – President of the 62nd Session – Abdelaziz Bouteflika (Algeria)". www.un.org. Retrieved 14 May 2017. ^ SINGHAM, A. W. (1976). "The Fifth Summit Conference of the Non-Aligned Movement". The Black Scholar. 8 (3): 2–9. ISSN 0006-4246. ^ Montgomery, Paul L. (22 December 1974). "Kissinger Meets Waldheim and Bouteflika at the U.N." The New York Times. Retrieved 14 May 2017. ^ "ALGERIA: New Leader". 12 February 1979. Retrieved 11 April 2018 – via www.time.com. ^ a b c Holm, Ulla (2005). "Algeria: President Bouteflika's Second Term". Mediterranean Politics. 10 (1): 117–122. doi:10.1080/1362939042000338881. ^ "Protesters boycott Algerian Polls". BBC. 30 May 2002. Retrieved 4 April 2019. ^ "L'Algérie entre amnistie et amnésie". Human Rights Watch. 19 April 2006. Retrieved 4 April 2019. La loi prévoit jusqu'à cinq ans de prison pour toute déclaration ou activité en rapport avec la «tragédie nationale» qui pourrait «porter atteinte» aux institutions nationales, à «l'honorabilité de ses agents» ou à «l'image de l'Algérie sur le plan international». ^ "Le président algérien relance la polémique avec Paris sur le rôle de la France durant la colonisation". Le Monde (in French). 29 June 2005. Retrieved 6 April 2019 – via AFP. ^ "Algeria - Air Force - Modernization". GlobalSecurity.org. Retrieved 6 April 2019. ^ "Middle East: Arab Leaders Resist U.S. Pressure At Algiers Summit". RadioFreeEurope/RadioLiberty. Retrieved 25 June 2017. ^ "Algeria's Hezbollah stance 'reflects view on resistance, not terrorism'". Middle East Eye. Retrieved 25 June 2017. ^ Aomar Ouali, "Bouteflika 'completely healed'" Archived 6 May 2006 at the Wayback Machine, Associated Press (news24.com), 18 December 2005. ^ "Algeria leader in French hospital", BBC News, 20 April 2006. ^ "Abdelaziz Bouteflika back in Algeria". lepoint.fr. Retrieved 16 July 2013. ^ "Algeria: Who is in charge?". The Economist. 6 February 2016. Retrieved 6 February 2016. ^ "Algerian president in France for medical checks". ^ "Algérie: vers la suppression de la limitation des mandats présidentiels" Archived 6 November 2008 at the Wayback Machine, AFP, 3 November 2008 (in French). ^ "Algerian opposition pulls out of 'pathetic' presidential vote", AFP, 15 January 2009. ^ "Bouteflika seeks third term in office", Reuters (IOL), 12 February 2009. ^ "Algeria: Stop Suppressing Protests". Human Rights Watch. 3 May 2010. Retrieved 25 June 2017. ^ "Algeria protesters push for change". www.aljazeera.com. Retrieved 25 June 2017. ^ a b Amir Akef; Charlotte Bozonnet; Madjid Zerrouky (23 February 2019). "Algérie:révolte inédite contre le pouvoir". Le Monde (in French). Retrieved 10 March 2019. ^ Alain Jordain (19 September 2013). ""Saïd Bouteflika veut me faire taire. Il n'y arrivera pas"". Tribune de Genève (in French). On m’accuse d’avoir porté atteinte à la sécurité nationale, à l’intégrité territoriale et à la gestion habituelle des institutions de la République. ^ Benjamin Roger; Farid Alilat. "Algérie : quand Saïd Bouteflika orchestre le silence présidentiel". Jeune Afrique (in French). Retrieved 7 April 2019. ^ "Algeria's Bouteflika to run for re-election". www.aljazeera.com. Retrieved 25 June 2017. ^ "Algeria's ailing president wins fourth term". Al Jazeera. 18 April 2014. Retrieved 19 April 2014. ^ "syriatimes.sy – President Assad Receives Congratulations from President Bouteflika on Winning Elections". syriatimes.sy. Retrieved 20 April 2015. ^ "Germany: Chancellor Cancels Visit To Algeria". Stratfor. Retrieved 11 April 2018. ^ "Algeria's Bouteflika urges spending cuts, warns on foreign debt". africaTech. 15 June 2017. ^ Akram Belkaïd; Makdar Benchiba (April 2009). "En Algérie, les décideurs de l'ombre". Le Monde Diplomatique (in French). pp. 1, 16–17. Retrieved 5 April 2019. ^ Jawad, Rana (6 March 2019). "The president who doesn't speak". BBC. Retrieved 10 March 2019. ^ "Algeria's Bouteflika warns of 'chaos'". BBC. 7 March 2019. Retrieved 10 March 2019. ^ Chikhi, Lamine; Hamid, Ahmed (11 March 2019). "Beset by protests, Algeria's Bouteflika will not seek new term". Reuters. Retrieved 11 March 2019. ^ "Algeria's Bouteflika will resign by April 28: State media". Al Jazeera. 1 April 2019. Retrieved 1 April 2019. ^ Ahmed, Hamid (4 April 2019). "Algerian president Bouteflika resigns: state news agency". Reuters. Retrieved 2 April 2019. ^ "G1 > Mundo – NOTÍCIAS – Lula e Sarkozy reforçarão associação militar entre França e Brasil". Retrieved 30 December 2016. ^ "Cidadãos Estrangeiros Agraciados com Ordens Portuguesas". Página Oficial das Ordens Honoríficas Portuguesas. Retrieved 1 August 2017.